Intel has officially confirmed the final specifications and launch dates of their remaining Core X series processors, including the flagship Core i9-7980XE. The upcoming processors will be fully compatible with the X299 platform that launched back in June. 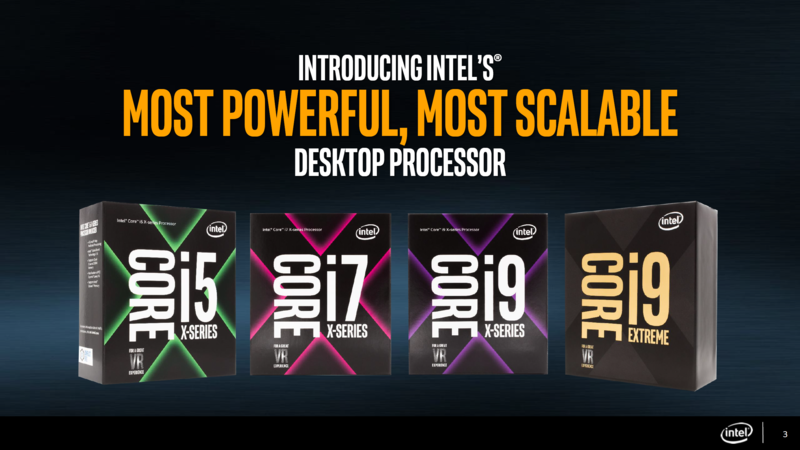 Today, Intel is releasing the specifications for the 12- to 18-core processors: Intel Core i9-7920X, Intel Core i9-7940X, Intel Core i9-7960X and the Extreme Edition Intel Core i9-7980XE processors. 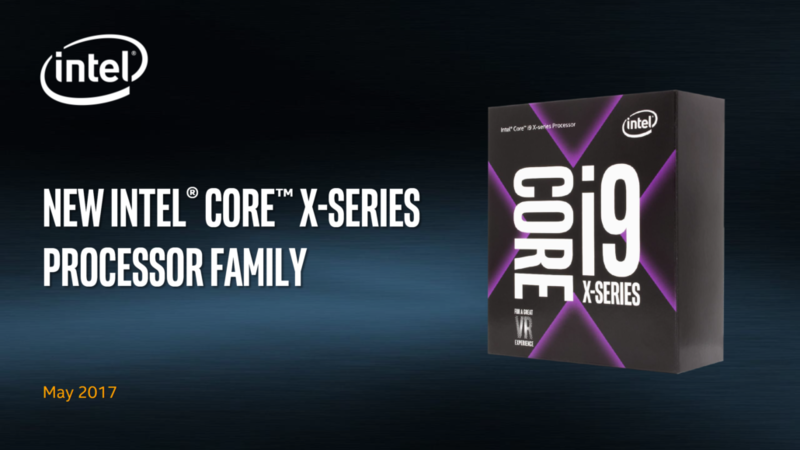 Announced at Computex 2017, the Intel Core X-series processor family is the most powerful, scalable and accessible high-end desktop platform offered by Intel, designed to deliver the performance needed to meet extreme computing demands for virtual reality (VR), content creation, gaming and overclocking. The new X-series processor family is the ultimate platform for content creators and gamers. Multitasking becomes extreme mega-tasking with simultaneous, compute-intensive, multithreaded workloads aligned in purpose, powered by up to 18 cores and 36 threads. And, with up to 68 PCIe 3.0 lanes on the platform, people have the ability to expand their systems with fast SSDs, up to four discrete GFX cards and ultrafast Thunderbolt 3 solutions. Content creators can expect up to 20 percent better performance for VR content creation and up to 30 percent faster 4K video editing over the previous generation. This means less time waiting and more time designing new worlds and experiences. Gamers and enthusiasts will experience up to 30 percent faster extreme mega-tasking for gaming over the previous generation. You must have read 68 PCIe lanes in the press release but do note that Intel is referring to both CPU and PCH PCIe lanes. These are not dedicated CPU lanes as the CPUs will still feature 44 PCIe lanes while 24 additional lanes would be provided through the X299 PCH. Priced at $1999 MSRP (you are paying $111.11 per core) and featuring the Skylake-X architecture, this beast of a processor will be the ideal go-to processor for content creators that want the maximum throughput in terms of rendering performance. This is a processor that will almost certainly be overkill for gaming (unless you are running some sort of CaaS enterprise). Priced at $1699 and featuring the Skylake-X architecture, the Core i9-7960X has the exact same core count as AMD’s highest end Threadripper CPU, the Ryzen Threadripper 1950X and that’s not a coincidence. Intel has put this particular CPU to take on the Threadripper platform in all its glory (and core count) and features the Turbo Max 3.0 technology just like its bigger brother. 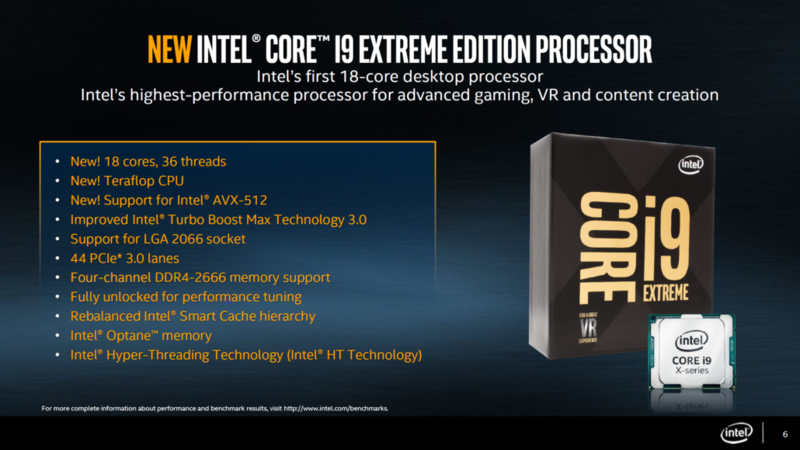 Priced at $1189 (you are paying $99.083 per core) ) and featuring the Skylake-X architecture, the Core i9-7920X is one of the more value oriented offerings for VR and content creators. The Intel Core i9-7920X will be Intel’s first 12 core, high-end desktop processor. 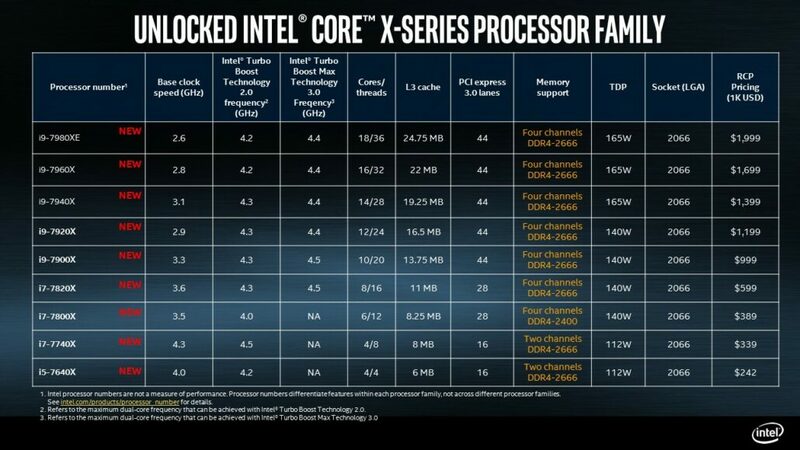 It won’t be the flag ship of the Core X family but it will still hold its own in terms of price and performance. While it’s good to finally know the clock speeds, the frequencies themselves are much lower than what we would have called ideal for many workloads. As we have seen, the Ryzen Threadripper chips have higher clock speeds and similar core counts but Intel may be going a different approach with the Extreme Core Count models. Instead of focusing at serial workloads, Intel is going to aim and market these chips with as increased parallelism. 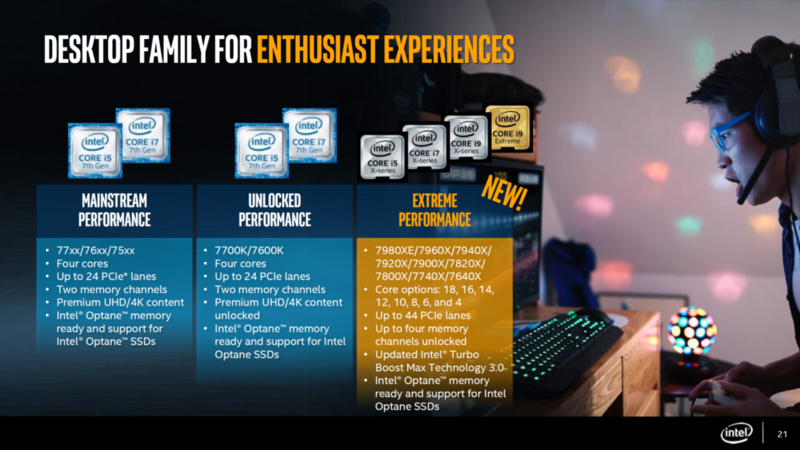 The reason is that Intel has already shown in their slides that these CPUs are designed for mega-tasking, a relatively new term in the industry that started with the Core i7-6950X. But mega-tasking is the future as people building such high-end systems with massive core counts aren’t just doing so for gaming. These PCs are better for content creation, development and heavy workloads and such tasks don’t require higher clock speeds as much as they take benefit of moderate yet stable clock speeds and Intel Core X can achieve a comparable clock speed to Threadripper in high core optimized workloads. We have however seen some early performance results between Intel’s 16 core and AMD’s 16 core processors and most of those show Intel in fairly good lead. The difference is that you are paying a premium of $700 US for Intel’s processor compared to AMD’s. For now, Ryzen Threadripper seems like a very powerful and cost effective price while with Intel, you seem to be paying more but getting a slightly good advantage in terms of single core boosts, lower TDPs and a more refined architecture.